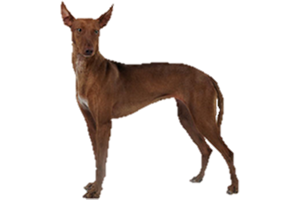 The Cirneco dell'Etna belongs to the family of ﻿primitive ﻿sighthounds found throughout the Mediterranean. Thisincludes the Pharaoh Hound, Ibizan Hound, Podenco Canario, and the Portuguese Podengo Grande. The term ‘sighthound’ is a bit misleading as the Cirneco dell’Etna uses sight, scent, and hearing while hunting. Their specialty is hill-coursing along the rocky and dangerous slopes of Sicily’s Mount Etna. There they were traditionally used to hunt rabbit. This breed is also successful with game birds, which it can be taught to retrieve. The Cirneco dell’Etna is an ancient breed that hails from Sicily, Italy. There it has existed isolated on the island for centuries. Before it was ever known for its hunting abilities, these dogs were kept as guardians of sacred temples. They have been found on the faces of several coins dating back as far as 6th century BC. It is unknown how the Cirneco first came to Sicily although the most commonly accepted theory is that they were introduced to the island by the Phoenician traders over 3,000 years ago. (This same is also the most common explanation for the arrival of the other Mediterranean sighthounds.) The Phoenicians would have brought their ancestors from Egypt, similar to the extinct Tesem. However, there are several other theories that are less often explored. One of these is that the Greeks, not the Phoenicians spread the ancestors of the Cirneco. They were also maritime traders and in ancient times shared the island with the Phoenicians themselves. The name Cirneco may be derived from the Greek word ‘Kyrenaikos’, the name of the Libyan city of Shahhat when it was under their control. It may be that Tesem dogs were first taken to Greek colonies in Eastern Libya before arriving in Sicily. There are several other theories involving native dogs, Abyssinian wolves, and/or the Kritikos Ichnilatis. The Kritikos Ichnilatis being a little known primitive breed from the island of Crete. Due to the location of Crete and Sicily, along with the Greek theory, there may be a link between the two. Wherever its ancestry lies the Cirneco became rooted and entwined with Mount Etna and the surrounding regions. It has faced extinction several times throughout the centuries. Like many breeds it suffered heavily during World War II, with only 30 recorded dogs remaining on the island. Some outcrosses with the Italian Greyhound were made during this time, but the numbers remain low. Today the Cirneco dell’Etna is recognized by the American Kennel Club although it remains rare outside of Italy. Is the Cirneco dell'Etna Right for You?